The family Tayassuidae was coined by American zoologist Theodore Sherman Palmer in 1897. The name peccary is believed to be derived from a Tupi (native Brazilian) word meaning "many paths through the woods", a reference to the forest-dwelling nature of some of these animals. The four species of peccary alive today can be found in a variety of habitats including arid deserts, dense forests, and open scrublands. Peccaries are superficially pig-like in appearance and are sometimes erroneously referred to as wild pigs or New World pigs. Both pigs (Suidae) and peccaries (Tayassuidae) possess relatively large heads with a cartilaginous disc at the tip of the snout covered in tough, leathery skin. However, this is where the similarities end. Listed below are the many important physical and behavioral differences between the two families. Wild Boar, Sus scrofa (left) and Chacoan Peccary, Catagonus wagneri (right). Although fossil records show that peccaries were once present throughout North America, Eurasia, and Africa, the family has been confined to the New World since Pliocene times. Pigs are native to Eurasia and Africa, but there is currently no evidence of them ever entering the New World until European settlers introduced them there in historic times. Peccaries have elongated canines that are oriented vertically and are hidden behind the lips when the jaws are closed. These teeth are ever-growing and self-sharpening, continually sliding against each other and maintaining honed tips. The dental formula for peccaries is consistent across all species; I 2/3, C 1/1, P 3/3, M 3/3 x 2 = 38 teeth. In pigs, the canines protrude laterally and curve upward so that their tips are visible outside the mouth when closed. Because they are not contained behind closed lips, the tusks of many pig species are able to grow to quite impressive lengths and shapes. The pig dental formula is more variable among the different species; I 1-3/3, C 1/1, P 2-4/2-4, M 3/3 x 2 = 34-44 teeth. 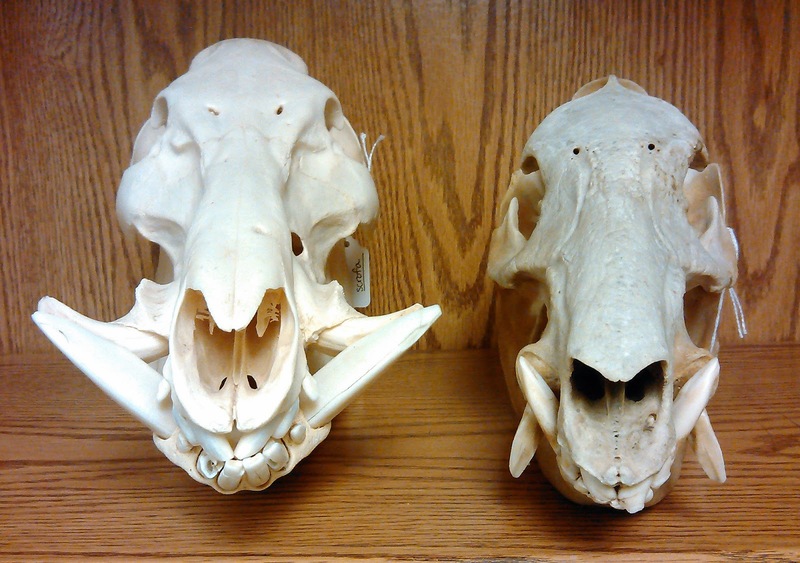 vertically-oriented canines of the peccary. Peccaries have a full coat of short, bristly hairs with an erectile mane running from the back of the head to the rump. They have compact bodies with longer, more slender limb proportions adapted for swift and sustained running. All peccaries possess four toes on their front feet, although the lateral toes are highly reduced and rarely contact the ground. The rear feet may have three (as in Tayassu and Pecari) or just two (as in Catagonus) toes. The tail is vestigial* in living peccaries, barely visible within the fur of the animal and composed of 6 to 9 small caudal vertebrae. The stomach is complex and two-chambered. Pigs have a much sparser hair covering, and those species living in the tropics may be completely bare-skinned. They are generally longer-bodied with shorter legs whose distal* elements never fuse. Although capable of considerable bursts of speed, these can only be maintained for short bursts. All species possess four functional toes on each foot. Pig tails are much longer, composed of 20+ vertebrae and are involved in non-vocal communication. They have simple stomachs. Modern peccaries are highly social and live in mixed herds that may number from five to several hundred individuals depending on the species. A scent gland is located on the lower back just above the tail, and is used in mutual grooming and scent marking. Sexual dimorphism among peccaries is weak with males and females appearing very similar externally with almost negligible differences in body size. Males and females form monogamous* pairs. Peccaries have a distinctive threat display during which they bare their tusks and produce a clattering sound by rapidly grinding them against each other. Peccaries are said to be highly aggressive and, although they may be farmed for their skins and meat, no species has been truly domesticated. A group of pigs, called a “sounder”, typically consists of mature females (sows) and juveniles (piglets). Males (boars) are generally more solitary although they may temporarily join maternal herds. Pigs have four scent glands, two on the rump and one behind each of the front hooves which they use to mark their territories. They are polygamous* and sexual dimorphism is much more obvious, with males growing up to twice as heavy as the females and having larger tusks. Aggression is conveyed by lowering the head and charging. One species, the Wild Boar (Sus scrofa), has been successfully domesticated resulting in a global distribution. Distal: situated away from the center of the body or point of attachment. Monogamous: tendency to form long-term mating pairs with a single partner at a time. Polygamous: tendency to form short-term mating pairs with numerous partners at a time. Vestigial: a small remnant, usually of an organ or appendage, that was more developed in an ancestor.